Good morning! I hope you all are enjoying this lovely fall weather we are having! (That is, if you’re in the eastern half of the U.S.). I’m sitting on the couch wrapped up in a blanket, drinking coffee. The windows are open and the crisp, fall air is just pouring in. Okay, I know the leaves aren’t turning yet, but I don’t care. I am so excited for fall! As I sit at home enjoying this fall morning, I thought I would share my ideas on fall decor with you all. It’s super easy and you don’t need to spend a lot of money to do it! There is a house on my street and every year they sell pumpkins, mums, bails of hay, dried corn…etc. No need to buy expensive fall decor items. Natural decorative touches go a long way without looking overdone and fake. You can also create a display on your porch with pumpkins and bails of hay. Just play around with it and see what looks good! If you like to have flowers in the house, consider some bittersweet or wheatgrass. These are gorgeous and add some fall color to your home. Again, you can create a display that you like! 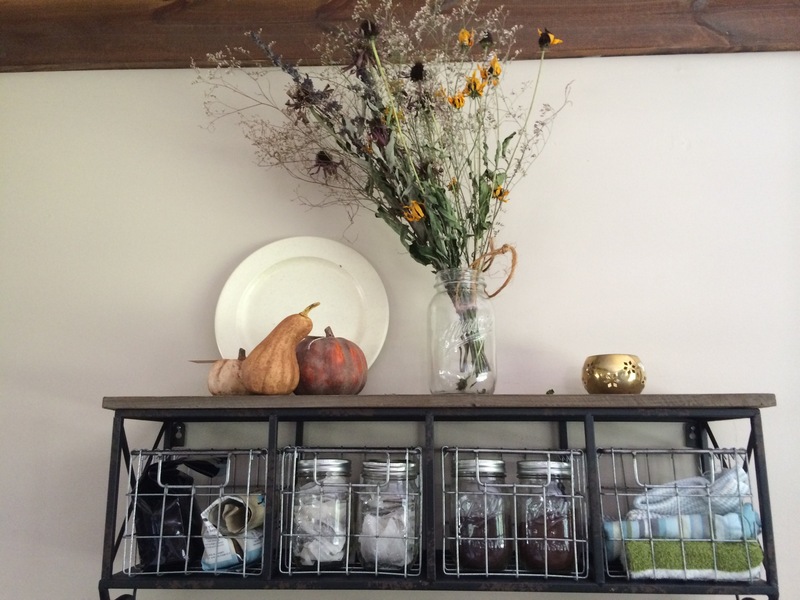 I chose some dried wildflowers with fake pumpkins that I picked up at a local antique store! Along with the joys of fall comes cooler weather. If you have hardwood floors like I do, it can be a challenge to make your home feel cozy without carpet. Layering with rugs and throws is one way to do that. Another way to achieve a cozy home is by adding texture and depth to your decor. I am really into those scented wax cubes right now! I just picked up a bunch of fall ones (including a hazelnut latte one, which I’m pretty sure is what heaven smells like). The candle warmers themselves aren’t so cheap but I bet you can find a good deal somewhere! The wax cubes are about $2 each which I don’t think is that bad! If you want a more natural way to go, there are tons of recipes where you can use natural ingredients and boil them on the stove or in the crock pot to create that fall aroma. Check out Apartment Therapy’s 5 Simmer Pot Recipes To Make Your Home Smell Like Fall. I hope I gave you some ideas on how to decorate your home simply and on a budget this fall! If you have other ways you like to decorate, please share your ideas! If you’re still excited for fall, read on where I share my recent apple picking trip and the fruits of our labor!